I really like to use eggplants in place of pasta. I consider it more healthier and delicious. 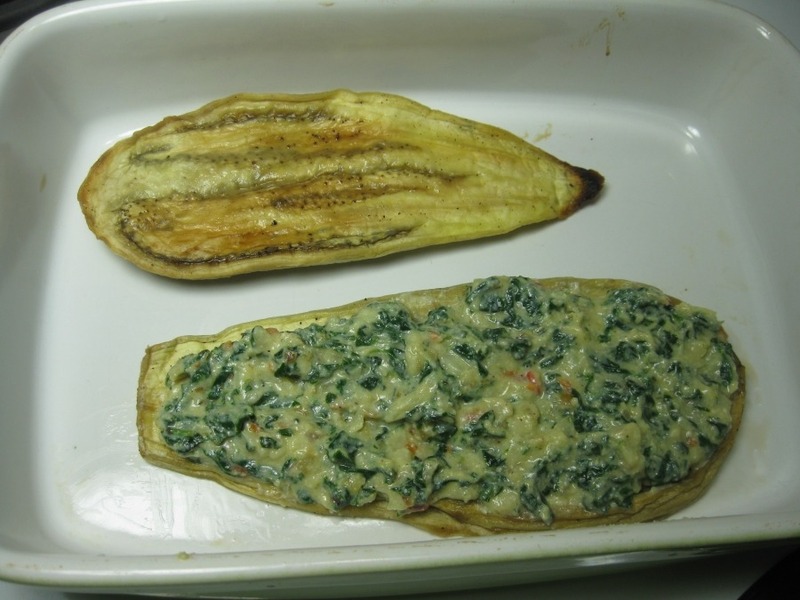 Since eggplants will need some extra time to drain bitter juices out of them, let’s do this first. 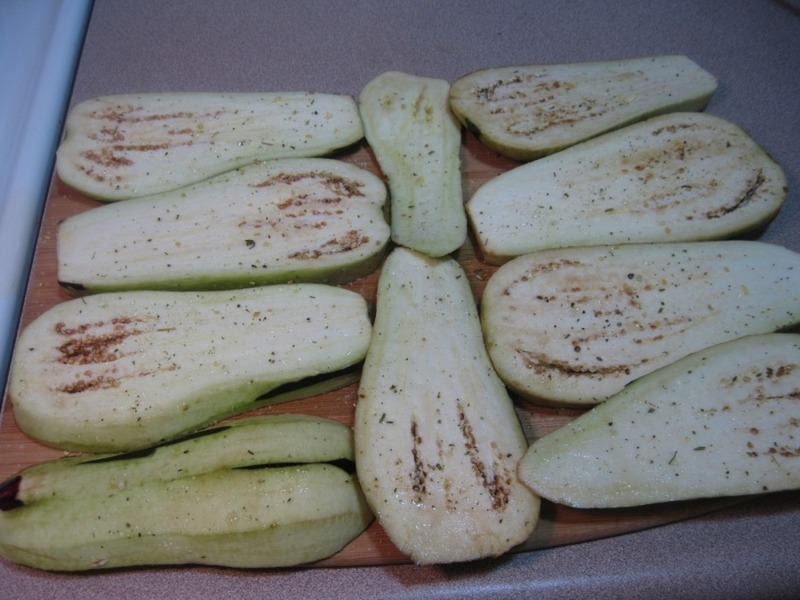 Wash eggplants, peal the skin and cut along in about 3/4 of an inch thick. Sprinkle them with salt on both sides and let them sit for about 20-30 min, to drain bitter juices out from them. Meanwhile, we will prepare the vegetable feelings. Peel the onion, and wash the vegetables. 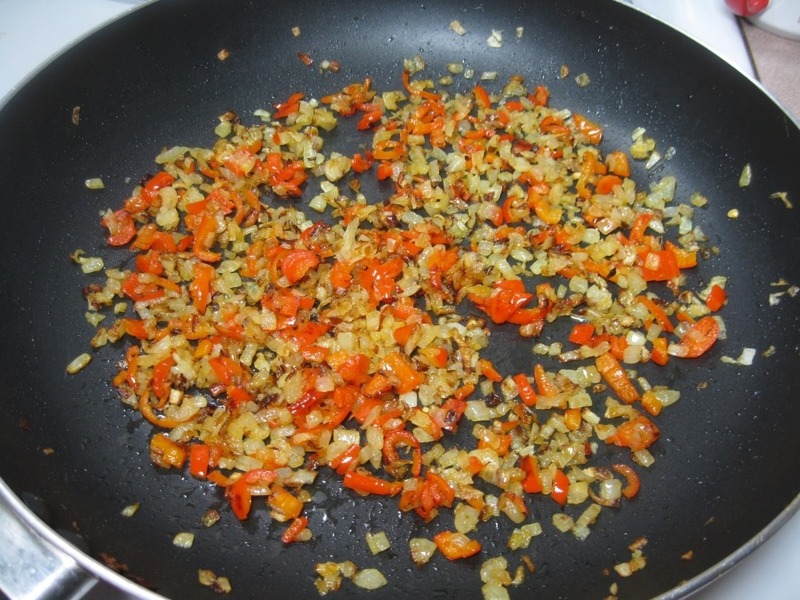 Dice onion and pepper and saute in a skillet with couple table spoons of olive oil. Sprinkle with salt and ground pepper. 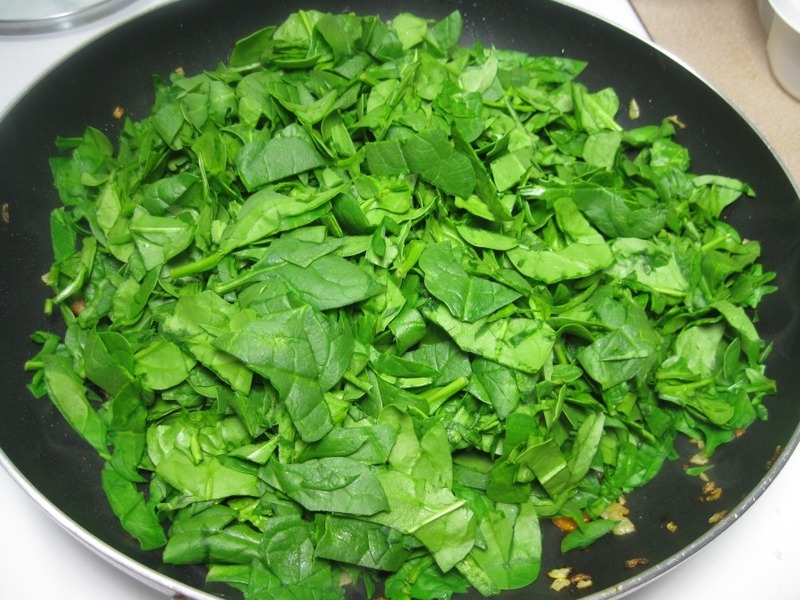 Coarsely cut or snip spinach with kitchen scissors. Add it to vegetables, and saute until slightly translucent. 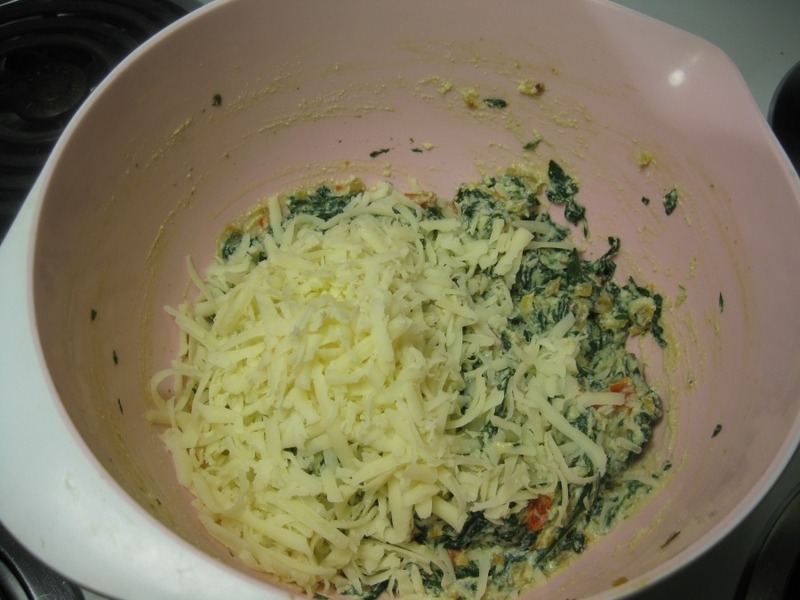 …mozzarella cheese. Combine all together. 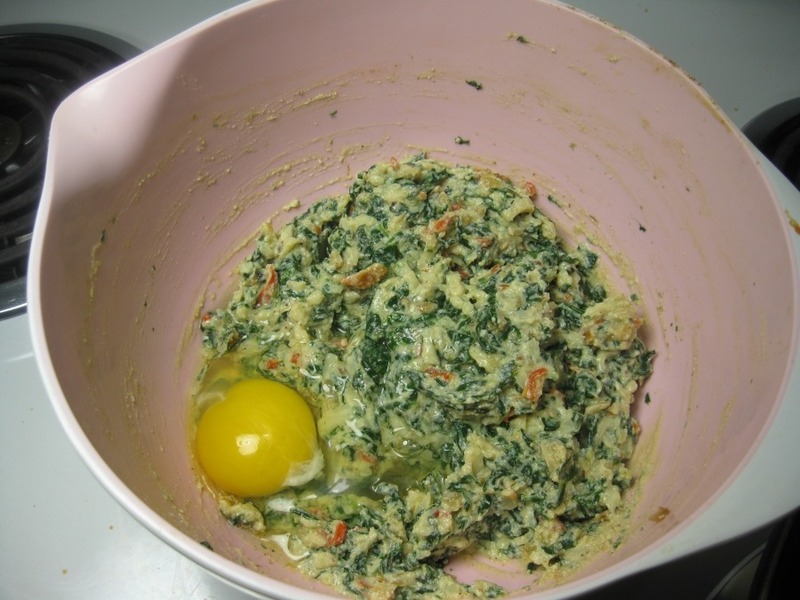 Add an egg and mix it all together one more time. 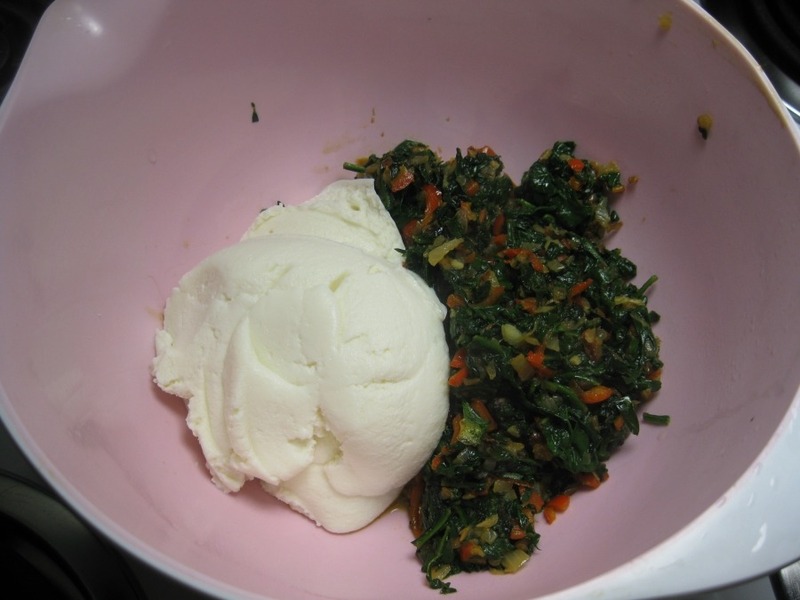 The vegetable fillings is ready. 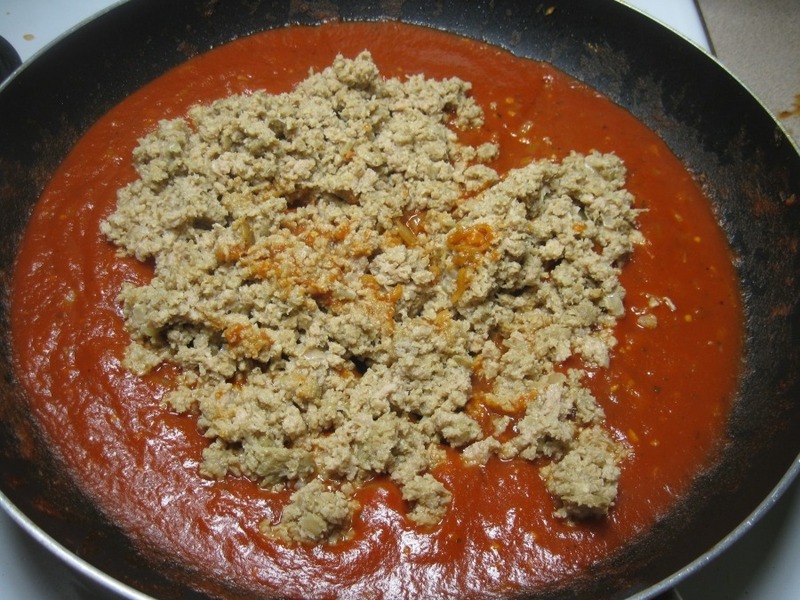 In clean skillet warm up a tomato sauce. I’ve used a Prego Italian Sauce. Sprinkle with some salt, ground pepper, coriander and sugar. Combine meets and mix it with sauce. 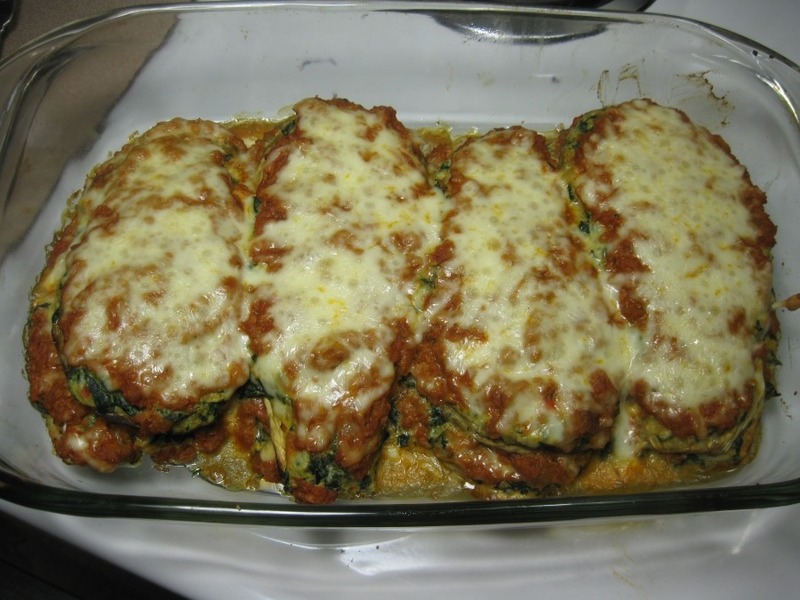 The sauce should taste good enough along, because the success of your dish will depend on the taste of your sauce. Tap them with paper towel to absorb the moisture on them. 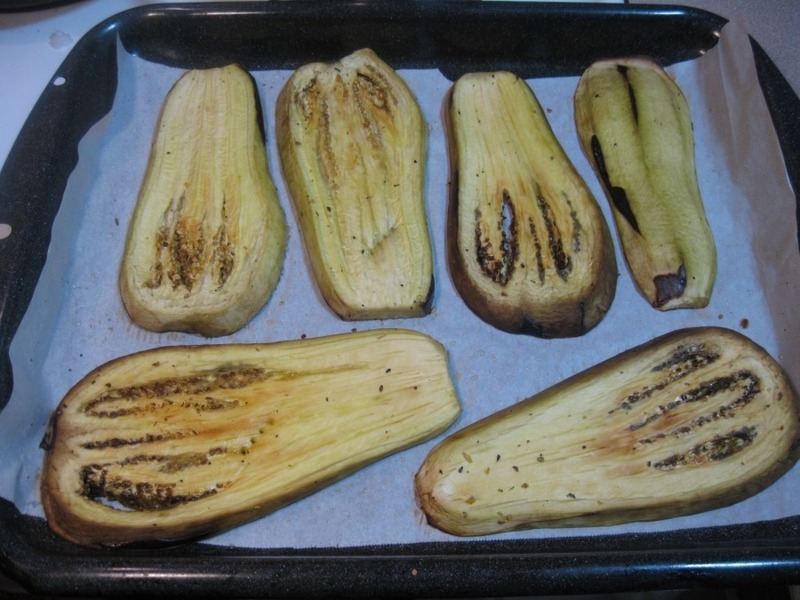 Sprinkle ground black pepper and coriander over eggplants. Place them on the baking sheet, brush over with some olive oil and bake in the oven at 350F for 30-40 min or until golden brown and soft. Let them cool before putting the filings on. 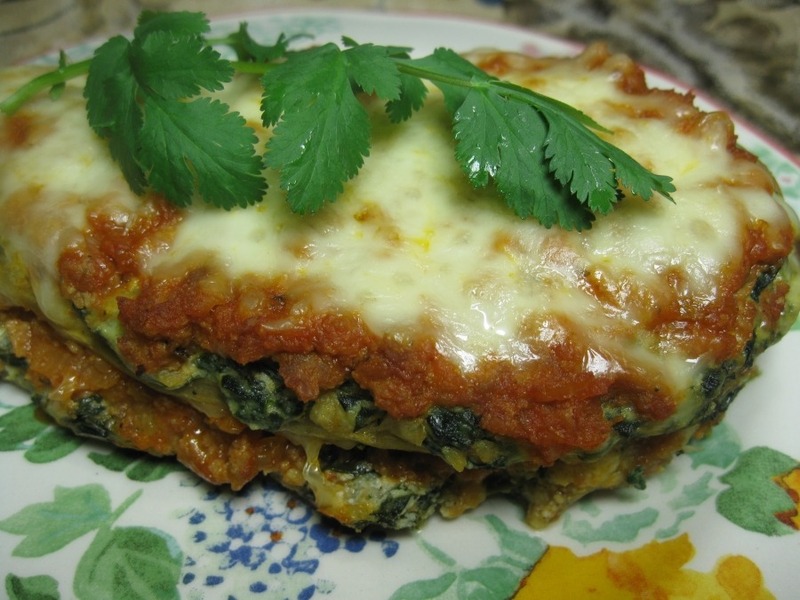 Now we will start layering our lasagna. 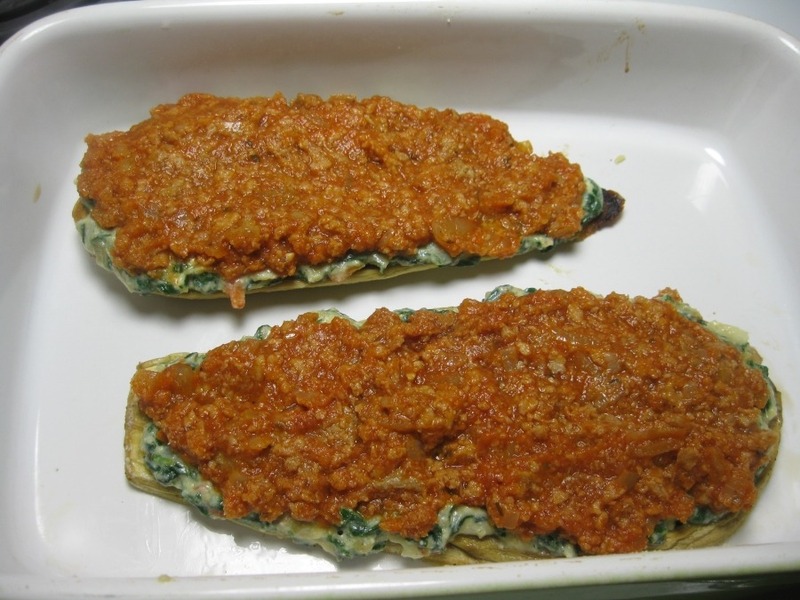 Spread the first layer of cheese mixture on the top of eggplant slices. 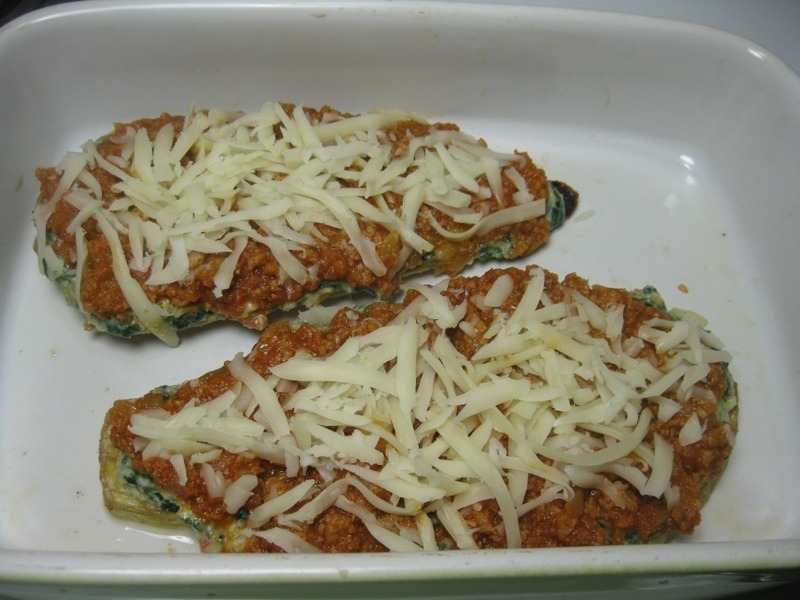 Sprinkle with more cheese… Put another eggplant slice and repeat layers. 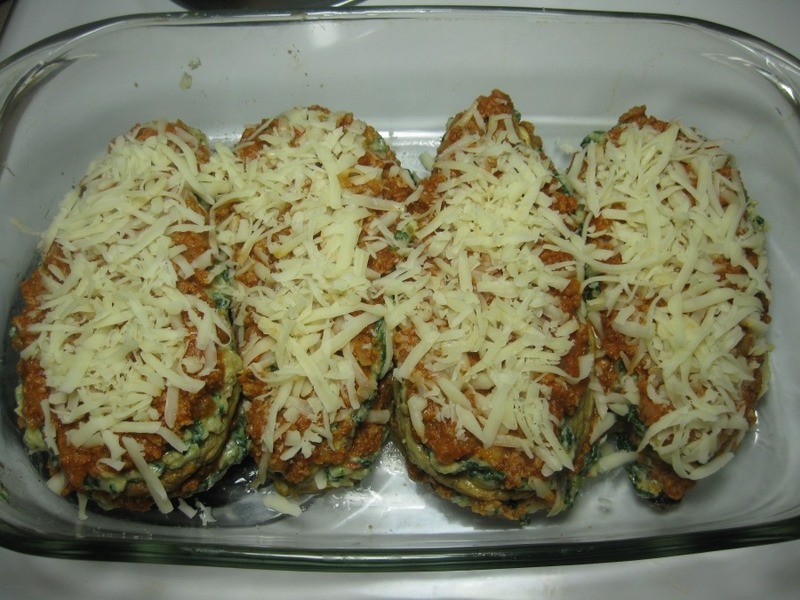 Finish with the shredded cheese on the top. Bake in the oven at 350F for 20 min to melt cheeses inside. Hope your family will enjoy it.